Berries & Herbs, originally uploaded by the workroom. Over the long weekend, I got to go to out of the city to visit a few plant nurseries. I wanted to go to Richter’s in Goodwood to pick up some different varieties of perennial herbs. Since it is already mid-summer, they didn’t have their full selection, but they still have many things I haven’t seen here in the city. I was able to pick up some Pineapple mint (it actually smells like pineapples! ), Mojito mint (this one is straight from Cuba and I can’t wait to try it in my personal version of the Mojito), Kent Beauty oregano (mostly because it looks so pretty), Thai basil and various Thymes. 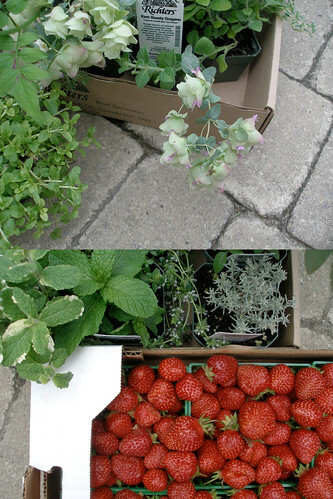 The other thing I got that day was a flat of Ontario strawberries. This was the best $12 I had spent. Having fresh berries morning, noon and night is my idea of heaven. Also, I made Strawberry Balsamic Sherbet, which is really yummy. I’ve been getting the Richters Herbs catalog for a couple years now. I absolutely love pouring through seed & plant catalogs, circling all the many things I want to grow. The Richters catalog is especially fascinating because they carry pretty much every herb you could think of from Banana Mint to Nutmeg Thyme to Valerian and Stevia. They also list all the medicinal features and the plants that can be used for natural dyeing. I’m started to get very interested in natural dyeing, so I’m planning next year’s garden (at home and at the workroom) to have plants that can be harvested for just that purpose. My other favourite seed catalog is Seed Savers Exchange. They save & share heirloom seeds in an effort to preserve our garden heritage. They sell over 70 types of tomato seeds alone! I’ve grown their Yellow Pear tomatoes and Black Krim tomatoes with delicious success. Partly gardening-related: If you’re going to New York this summer, definitely make a stop over to P.S.1 in Long Island City on a Saturday. This year is the ten year anniversary of their weekly Warm Up event. Lots of great music, art and incredible people watching in their outdoor courtyard. This year the space is transformed into an urban farmland. I’m intrigued by the idea of gardening in cardboard tubes. (via Cool Hunting) The Warm Up event started the summer before I moved to New York, so their ten year anniversary is making me feel old and a bit nostalgic. Karyn, thanks so much for your mention of my Strawberry Balsamic Sherbet. It’s so gratifying to hear that you enjoyed it. Your blog is gorgeous and stunning! Part of the sheer pleasure of blogging is discovering the amazing creativity and talent in every corner of the world. I love your photos and all these lovely fabrics and designs. I look forward to visiting often. Great work. pastrystudio – It’s nice to meet you! Thanks so much for such a great recipe. I’m not ashamed to say that I haven’t been sharing the batch of sherbet with anyone else, it’s too good. I’ve had it bookmarked for a while and I just noticed your lime sorbet recipe. I’ll be making that on my day off. yum! Perhaps next spring we can organize a group visit to richter’s. There is also a chip truck just down the road, which is just what one needs on an outing into the ‘country’.